It was time to make a birthday cake for my little brother, Justin, 6 foot 1 inch tall and about twice my weight, but still my little brother. He doesn’t really get excited about cake so I struggled a little over this one. Lon reminded me that Justin isn’t into frosting. It seems he often wipes some off. Janny reminded me that Justin likes blueberries. 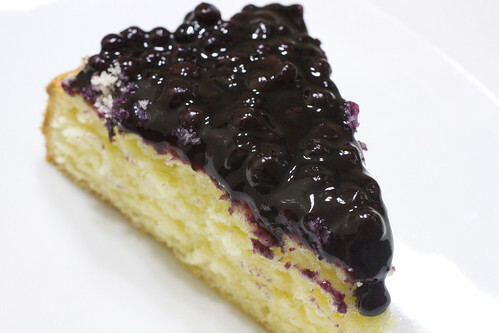 So, despite using blueberries on a cake just recently, I was going to do it again, but in a birthday cake with no frosting. I know some would not call it a birthday cake if it does not don the billowy puffs and swirls of sugar, so if that’s you, just call this a perfect tea time cake. It was Angie’s birthday and Angie is a Taste Bud, a term I’ve given to friends who share my love of food and have impeccable taste. I get restaurant recommendations from her all the time. You can thank her for introducing us to Degustation, Eletarria (closed now), The Red Head, and many more. She’s no stranger to the bakery scene either, so my brain was cranking. What would it take to impress her? We had to make a cake super fast yesterday. Luckily, we had left-over frosting from the Red Velvet Cake. I also wanted to use up the buttermilk (bought for the Red Velvet Cake), so a plan was born. 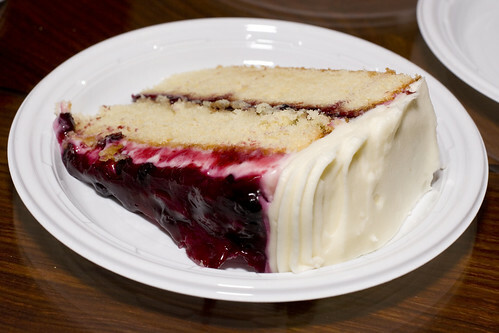 I found a Nick Malgieri Recipe for Buttermilk Cake Layers. I would use the left-over frosting, and I’d throw in a strawberry and blueberry filling/topping of my own, to dress it up. It seamed like an easy plan in my head. Ok, so it turns out, it’s not THAT easy, but it’s not really hard either, just a few more steps… We were just in a real rush and had to throw it all together so fast that the frosting job wasn’t gorgeous but it tastes REALLY good. It’s now one of our favorites and will probably be frequently made as a birthday cake. 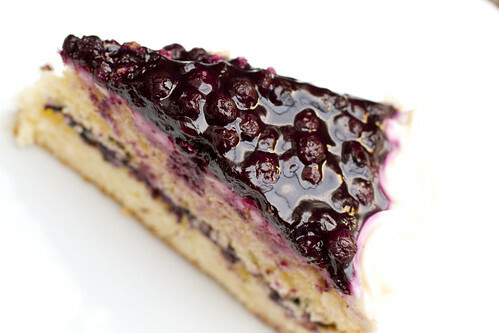 I want just about anything made with blueberries. 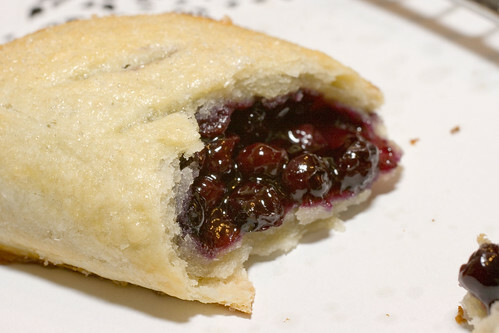 Along with cherries, they share the pedestal for my favorite fruit, so when I saw a recipe for Blueberry Hand Pies on A Southern Grace, I bookmarked it right away. I did tweak the recipe a bit to my liking, but how can you go wrong with a portable pie, you can eat without a plate and fork? Following up on Part 1, 2, and 3, is probably my final post on this subject, as I have now found my favorite scone recipe, and I’m now also pretty sick of scones. In The King Arthur Flour Baker’s Companion, I found an Apricot Cream Cheese Scone recipe and I was certainly intrigued. Cream cheese doughs are always fantastic, right? Well, I didn’t have any apricots and they’re not in season anyway so I used organic frozen wild blueberries and also added a glaze just for kicks. Lon’s a lactard (lactose intolerant) and he doesn’t love soy bean milk so we gave almond milk a try. It turned out to be quite good. In cereal, it’s similar to a lightly flavored skim milk, and even better, it’s healthier. We buy the Blue Diamond brand and it’s only 60 calories per serving (8 oz) for the original and 90 calories per serving for the vanilla. So, I wanted to try almond milk in more applications, and the first experiment turned out well. 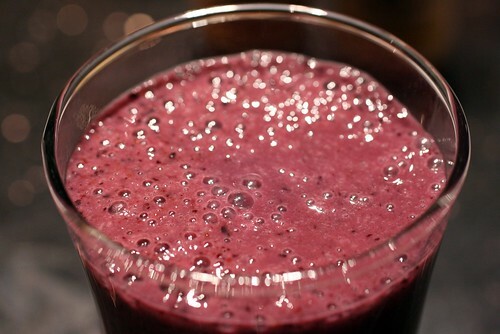 This Blueberry Banana Smoothie doesn’t taste like the dairy version but it’s thick like any good smoothie, yet feels lighter.